Tuareg unrest is a recurring problem in Mali, a country with some 700,000 square kilometers of harsh, inhospitable desert. While the government of Mali is working to strengthen security in northern Mali and to consolidate peace with Tuareg rebels, northern Mali remains unstable. Northern Mali experiences periodic violence involving bandits, smugglers, paramilitary forces, ethnic violence, and Al-Qaeda in the Land of the Islamic Maghreb (AQIM). The Malian government has difficulty in imposing order in distant northern regions where local groups do not hesitate to use guns and fast 4x4s to try to impose their position, whatever Malian law. Tuareg unrest broke out in May 2006 with attacks on Malian military outposts in Menaka and Kidal. Algeria has taken ae lead in working on issues related to the African continent. In July 2006, the Malian government and Tuareg rebels signed an Algerian mediated peace agreement known as the Algiers Accords. After Algeria negotiated the Algiers Accords between the Malian Government and Tuareg rebel groups, it continued to play an active role in seeking resolution to that conflict. On August 26-27, 2007, Tuareg dissidents attacked and kidnapped civilian and military convoys near the Mali-Niger border. On August 30, 2007, a truck transporting civilians from Algeria to Tinzawaten, Mali, hit a landmine, killing at least 14 people. In September 2007, armed rebels attacked the Malian military garrison at Tinzawaten. Intra-Tuareg tensions divided the Alliance for Democracy and Change (ADC), Mali's third large-scale Tuareg rebel movement (like that of the early 1990s, also led by the Ifogas Iyad ag Ghali). In late 2006 the ADC engaged with elements of what is now AQIM in northern Mali. ADC members who participated in the AQIM attacks later reported that ag Ghali had quietly directed fellow Ifogas to pull back just as the ADC prepared to attack AQIM. This forced the ADC's Idnane and Taghat Melet members to face AQIM alone. Afterwards, Ifogas reportedly refused to help fellow Idnanes and Taghat Melets negotiate for the release of prisoners captured by AQIM. One disaffected ADC member, who said he was eventually forced to speak with AQIM leader Bel Moctar directly to win the release of a captured relative, described the ADC as weakened to the point of dissolution following this episode. Interestingly, Ibrahim ag Bahanga's MNTA also divided along ethnic lines. Although Bahanga originally attracted some support from younger non-Ifergoumessen Ifogas when he first took Malian soldiers and government officials hostage in 2007, northern contacts indicate that this support evaporated as Bahanga became increasingly isolated. By late 2007 the MNTA appeared to be a largely Ifergoumessen phenomenon managed by northern Mali's three most visible Ifergoumessen: Bahanga, Hassan ag Fagaga and Bahanga's Paris-based father-in-law, Hama ag Sid'Ahmed. Bahanga's decision to attack the Malian military was often portrayed as an attempt to protect his smuggling fiefdom in Tinzawaten, but in a larger sense, he may have seen it as striking a blow for the commercial interests of his family and for the Ifergoumessen fraction as a whole. Like their predecessors in the 1980s and 90s, many younger Tuaregs were unemployed with little to no education, and they likely filled out the fighting ranks of the ADC in 2006. Some are certainly with Bahanga in Tinzawaten. Others are involved in northern Mali's increasingly lucrative business of smuggling arms, cigarettes and drugs. Tuareg leaders are clearly concerned about the direction of Tuareg youth, as evidenced by repeated campaigns by Tuareg elders to "sensitize" youth in Kidal about the dangers of joining up with Bahanga or taking matters into their own hands. Although each of Mali's rebel movements is unique, there are some common themes that may provide clues to potential future developments. One element that linked 2008 with the 1990s was restive, unemployed youth. Another was a stalled peace agreement, negotiated with Algerian support, to resolve rebel attacks mounted by a group led by Iyad ag Ghali against Malian military outposts. Given the similarities between the 1991 Tamanarasset and 2006 Algiers Accords, and the results following the collapse of the former, the failure of Algiers would prove significant. Unfortunately, Mali and Algeria made little progress toward implementing key aspects of the 2006 agreement. Whether Mali has the political will and financial means to meet the terms of Algiers are open for debate. Bahanga's mini-rebellion in Tinzawaten further diverted attention away from implementing the Algiers accords and blocked the very development that could forestall future violence. In 2008 attacks by groups of armed Tuaregs, including the Northern Mali Tuareg Alliance for Change (ATNMC) and the Alliance for Democracy and Change (ADC), injured civilians and displaced thousands of persons. In April 2008 local and international aid organizations estimated that there were 3,250 IDPs in Tinzawaten, 800 in In-Bulal, 3,500 near Aguelhok, and more than 3,000 near Kidal. An unknown number of IDPs went to distant desert encampments or to Algeria. The government provided some assistance to IDPs, allowed the International Committee of the Red Cross (ICRC) access to IDPs, and permitted IDPs to accept assistance provided by humanitarian organizations. The distances involved, difficult local terrain, land mine concerns, and rebel attacks hampered assistance efforts. The government did not attack or target IDPs or forcibly return or resettle them. After peace negotiations in August, the government and Tuareg rebels actively promoted the safe return of displaced persons; however, many persons remained displaced at year's end. On October 16, 2008, bandits in the Kidal region of Mali car-jacked two vehicles belonging to the International Committee for the Red Cross. On December 20, 2008, Tuareg rebels attacked the Malian military base in Nampala, the northernmost town in the central region of Segou. Subsequent security incidents involving Tuareg rebels occurred near the towns of Nara, Goumbou, and Mouridah in the region of Koulikoro on December 24-27, 2008. Disparate Tuareg rebel groups attacked Malian military units in Tessalit in July 2008, in Abeibara in May 2008, and in Tinzawaten and Bourghessa in March 2008. The Ganda-Izo militia, composed of ethnic Peuls and Songhai, killed four civilians of Tuareg descent: Rhissa ag Intawin, Zeynudin ag Sidiya, Attaher ag Erhq, and one other villager on 01 September 2008, in the town of Hourala. In response security forces arrested several dozen suspected Ganda-Izo members, including some members of the security forces. On September 15, in the village of Fafa, the military attacked a suspected Ganda-Izo hideout, arresting several more suspected Ganda-Izo members. One suspected militia member and one soldier were reportedly killed and an unknown number of persons injured. While the government released many of those arrested, an unknown number of others remained detained without charge at year's end. On September 25, Amadou Diallo, the leader of Ganda-Izo, was arrested in Niger and extradited to Mali where he remained detained without charge at year's end. Despite the Algiers Accords, Tuareg rebel attacks continued until January 2009 when Mali and the Tuareg rebel Alliance for Democracy and Change (ADC) reached a settlement permitting the disarmament of the ADC and the return of rebel combatants to barracks in Kidal. Representatives of the Malian government and the Tuareg rebel group Alliance for Democracy and Change (ADC) met the weekend of 18-19 July 2009 in Bamako to discuss the status of implementation of the Algiers Accords, originally signed July 4, 2006. Algerian Ambassador to Mali Abderkrim Gheraieb facilitated the meeting. As Mali re-engaged its northern regions, the Tuareg rebels have agreed to assist the Malian government in its fight against Al Qaeda. Specifically, the ADC has agreed that special "mixed" units of former Tuareg rebels under the command of Malian officers can be used to track and hunt down AQIM forces in northern Mali. It was initially unclear if the agreement to use mixed units to pursue AQIM would overcome the government's reluctance to fully integrate former rebels into the military. However, the agreement could provide a powerful incentive for the Malian government to do so, as the Tuareg rebels - like AQIM - possess an intimate knowledge of the north's terrain, and the ability to operate effectively in the harsh desert environment. Many observers were of the view that only the Tuaregs were capable of chasing AQIM from Malian territory, reflecting doubt that the Berabiche Arabs allied with the government would provide a sustainable effort against AQIM. Faced with mobile enemies on harsh terrain, the Malian Army has created a number of specialized units known as Echelons Tactiques Inter Armes, or ETIAs. The ETIAs are small, mobile task forces more capable than the average Malian army unit of operating in the isolated desert environment of Mali's northern regions. They are composed of elements from the Malian regular army, and are intended to be provided with additional equipment and transportation, although in practice the Malian army simply has not had the resources to do this. ETIAs are often accompanied by units of irregular soldiers from northern Mali's many private militias. In both the battle against Tuareg rebel leader Ibrahim Ag Bahanga and the subsequent drive against AQIM, ETIAs fought alongside units of irregular soldiers belonging to local militias. This alliance was driven by the necessity of having personnel who have knowledge of the local terrain and local communities, which most Malian army regulars lack. In early 2009, Tuareg militias led by Colonels Ould Meydou and Elhadj Gamou joined the ETIAs and helped make possible the ETIAs' victories over Bahanga at Tin Essalak and Bouressa. Bahanga was ultimately pushed out of Mali into Libya. Mali decided to deploy Arab militias against rogue Tuareg rebel leader Ibrahim Bahanga. These militias were fielded by northern Malian Arab traffickers interested in ending Bahanga's harassment of Arab-run smuggling convoys through northern Mali. Having joined with the Malian military to forcibly oust a common foe, Arab traffickers were stronger than before and circulating more freely than in the past. Tuareg rebel Alliance for Democracy and Change (ADC) leader Iyad ag Ghali was the primary force behind Bahanga's Libyan exile. Iyad himself had lost the confidence of fellow Tuareg rebels, the Malian government, and Algerian mediators. There were other reasons for ag Ghali's diminished stature on northern Mali issues dating from 2008 when ag Ghali returned to Mali from his post with the Malian consulate in Djeddah, Saudi Arabia, ostensibly to help President Toure manage Bahanga's burgeoning rebellion. Mali, Algeria, and fellow Tuaregs had believed ag Ghali had returned to Mali to cement Bahanga's release of the four Malian military officers. However, when ag Ghali, Minister of Territorial Administration Kafougouna Kone, and a previously unknown Arab businessman named ould Meloud who has recently emerged as a close confidante of President Toure's, arrived in Kidal, the liberation deal suddenly fell apart, leaving Minister Kone to return with just one of the four Malian military officers. Many believed that ag Ghali was behind Bahanga and everything that went wrong in the region of Kidal. 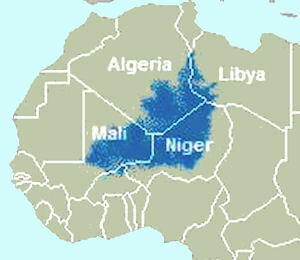 Since the mid-1980s violence has periodically erupted between the Tuareg and Peuhl ethnic groups along Mali's border with Niger. In 2009, several attacks were highly publicized, including one near Ansongo, Mali where Malian Tuaregs killed 12 Nigerien Peuhls and close to 1,000 head of cattle in retaliation for the murders of four Tuaregs and an unknown number of cattle. The Malian National Guard sent an additional 200 troops to Gao province in August 2009 to help quell the violence. Population growth and inadequate rainfall are stretching agricultural land usage to its limits. In 2008, a 60 percent rainfall deficit caused estimated losses of 30 percent of some populations' herds of cattle, sheep, and goats. Whereas Malian Tuaregs and Peuhls tend to settle seasonally in established towns, Nigerien Peuhls, are purely nomadic with no established towns or watering holes. They use pastureland until it is exhausted then move on to new lands. With increased environmental pressures in the past 20 years, these two distinct pastoral cultures have clashed more frequently than before. Malian Tuaregs view the Nigerien Peuhl nomads as parasitic since they do not attempt to manage or improve the natural resources they are using. Competition for land and water leads both groups to attack each other and to engage in reprisals. According to Radio France International (RFI), in October 2009 hundreds of Nigerien Patriotic Front (FPN) combatants handed over their arms to Nigerien authorities in Tidene valley, north of Agadez, starting in late September. The process was expected to continue over several days. Mohamed Anako, the High Commissioner for the Restoration of Peace, told RFI that the process has been launched, and a general arms handover ceremony involving all fronts would be held "in the near future." This was a result of peace talks between rebel Tuaregs and the Government of Niger, which last took place through formal channels in May 2009. Conflicts, generally occurring during the June-October rainy season, are allegedly due to Nigerien agricultural policy. The Nigerien government orders nomadic Peuhls off agricultural lands near the Mali-Niger border during the rainy season to increase agricultural production, and allegedly gives them small arms to facilitate their entry into Mali and use of Malian land resources. Nigerien local leaders tell their Malian counterparts the Nigerien central government protects the Peuhl militias, and when Malian law enforcement officials arrest Nigerien Peuhls accused of cattle rustling, the Nigerien government allegedly sends delegations to negotiate the prisoners' release. The violence seemed to be calming down as the 2009 rainy season comes to a close, but local political leaders from Gao were concerned that problems could expand further into the Gao region and Mopti region in coming years. There were reports in 2010 that the paramilitary militia of Colonel Elhedji Gamou committed abuses against civilians in Kidal Region. Allegations concerned armed banditry, drug trafficking, arbitrary violence, and reprisal attacks. On April 25, Intalla ag Attaher, the traditional leader of Tuaregs in Kidal, wrote to President Amadou Toumani Toure and threatened to exile himself if Gamou's militia was not withdrawn or reined in. In response, a high-level delegation traveled to Kidal on May 2 to speak with ag Attaher about the situation. Reports indicated a moderate improvement in the militia's respect for civilians' rights in Kidal since that time. Sporadic violence between the Ganda-Izo militia, composed of ethnic Peulh (nomadic) and Songhai (sedentary pastoralists), against neighboring Tuareg (seminomadic) factions in the area of Ansongo (Gao Region) continued. On 02 August 2010, the government organized a "Flame of Peace" disarmament ceremony in Fafa, a small village in the Ansongo area. An estimated 400 militants from all three ethnic groups participated in the disarmament, and 367 weapons were collected and burned. Notwithstanding the new effort at peace, reports continued of livestock theft and reprisal attacks between the communities. The threat of inter-tribal violence declined toward the end of 2010 due to a truce signed between the two main instigating Tuareg tribes. The potential for violence between rival smugglers continues, however. In one instance, on December 29 and 30, 2010, a battle between two armed groups of drug traffickers allegedly broke out in northern Mali, near the town of Tarkint, with reports of casualties ranging from as few as seven to as many as twelve. Mali found itself as a crossroads in 2010. One of Mali's great mistakes, according to Malian President Amadou Toumani Toure (ATT), was to agree to demilitarize the north following peace agreements with the Tuareg rebellion in 1992 and to reinforce this move to demilitarize following the Algiers Accords in 2006. As things stood, the Malian army was confined to bases in the cities of Timbuktu, Gao, and Kidal. The Government had failed to set up the special mixed units which were to have incorporated former Tuareg and Arab rebels.